The Little Blog Dress: It's Derby Day! This may come as a surprise to you but I LOVE THE KENTUCKY DERBY! I love everything about it and I hope to see it in person one day! We usually go to the dog track to place our bets, although I am starting to enjoy the ease of Twin Spires! 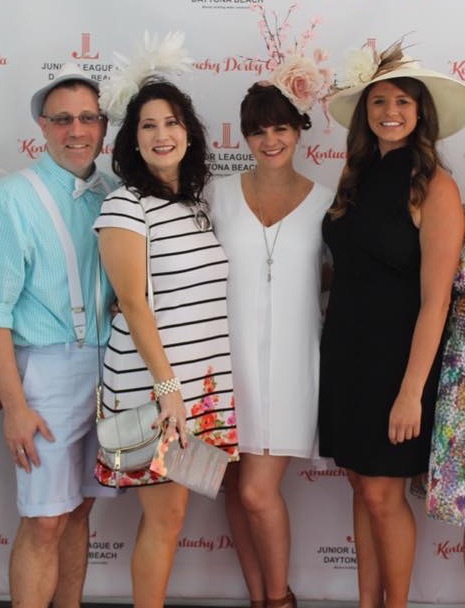 Last year, I finished out my last couple of weeks as President of the Junior League and we had an amazing Derby party! I was fortunate enough to buy a hat from Arturo Rios who has designed hats and costume for many famous people including Lady Gaga during her stint on American Horror Story. Look how my friends and I rocked the day! As much as a fan as I am of the Derby, the outfits and the betting! I am so excited that the Kentucky Derby also means that 14 Hands releases exclusive wines for the Kentucky Derby! 14 Hands Winery continued their partnership with the “Run for the Roses,”™ for the fifth year running. Along with their 3rd vintage of the Limited Release Kentucky Derby® Red Blend (which is delicious), they also released a brand new wine, the 14 Hands 2016 Rosé, which I will be drinking while watching the race this weekend. 14 Hands Winery selections are offered nationwide. The 2016 Rosé freshens up the already impressive varietal line-up from 14 Hands Winery. This beautifully, light pink Syrah-based Rosé opens with delicate aromas of rose petals and rhubarb. Refreshing flavors of melon and strawberries are followed closely by a kick of citrus in the finish. Perfect by the glass or with light salads like a classic Niçoise, grilled tuna, paella and salty cheeses. This Limited Release Red Blend was crafted to commemorate 14 Hands Winery proud sponsorship of the Kentucky Derby®, the legendary Thoroughbred race that dates back to 1875. Serve this wine at your Kentucky Derby viewing party paired with party favorites like pulled pork sliders and beef tenderloin skewers.